A few weeks ago we got a note in the mail that our neighborhood was going to hold a block party. Sounds like fun! I knew it wouldn't be anything like the block parties I used to organize for our block in Philly - if you are from Philly or have lived there you know what I mean! Every yard packed with friends and family all afternoon and night, grills smoking in every yard, games, prizes, decorations and Christmas lights, and dancing until midnight or later. But it would still be nice to get out and see our neighbors and maybe meet some new people, too. The note asked everyone to bring something for the food tables. What you brought depended on the first letter of your last name. A-M brings an appetizer, N-Z brings a dessert. Great, I fall into the dessert category! I never make dessert and I do not enjoy baking at all. I considered buying something, but then turned to the wonderful ladies on the cooking board I belong to for ideas. I knew I could count on them to give me ideas for something fabulous that wouldn't frustrate someone who hated all the precise measuring involved with baking. 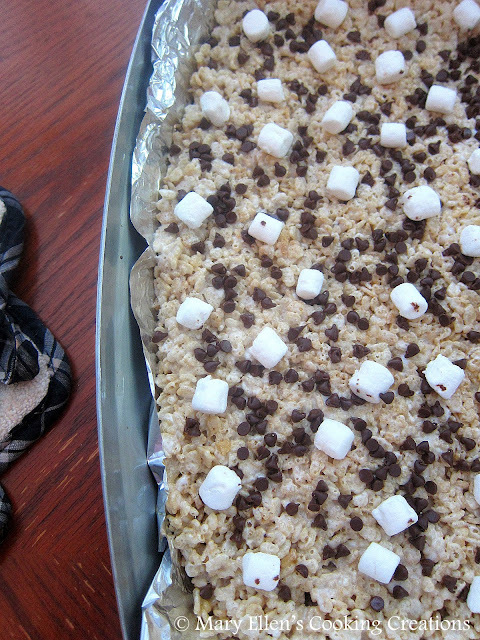 Elly suggested that I take a look at a recipe Courtney had posted on her blog, Cook Like a Champion, for S'mores Rice Krispies Treats. I didn't even have to look at the recipe to know that I wanted to make them. 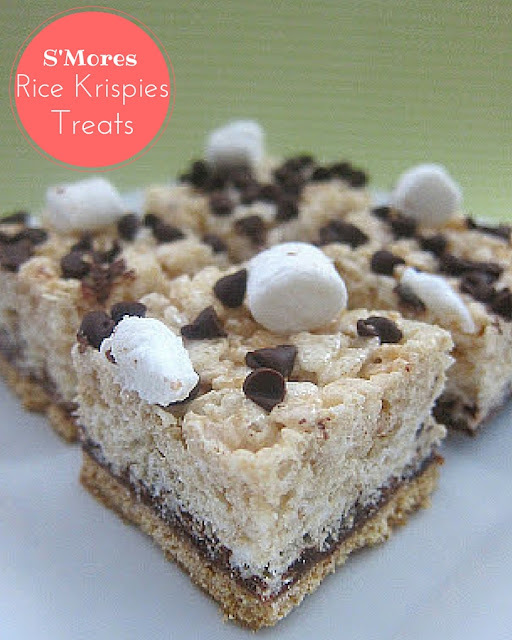 Who doesn't love Rice Krispies Treats? And add in some of the ingredients from s'mores - sounded great! 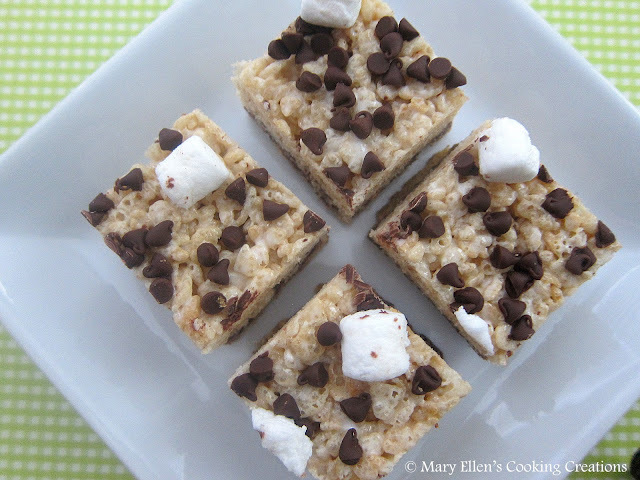 Wow - these were so easy, so adorable, and were the perfect treat to bring to the party. I made one change to the recipe (original is posted below). 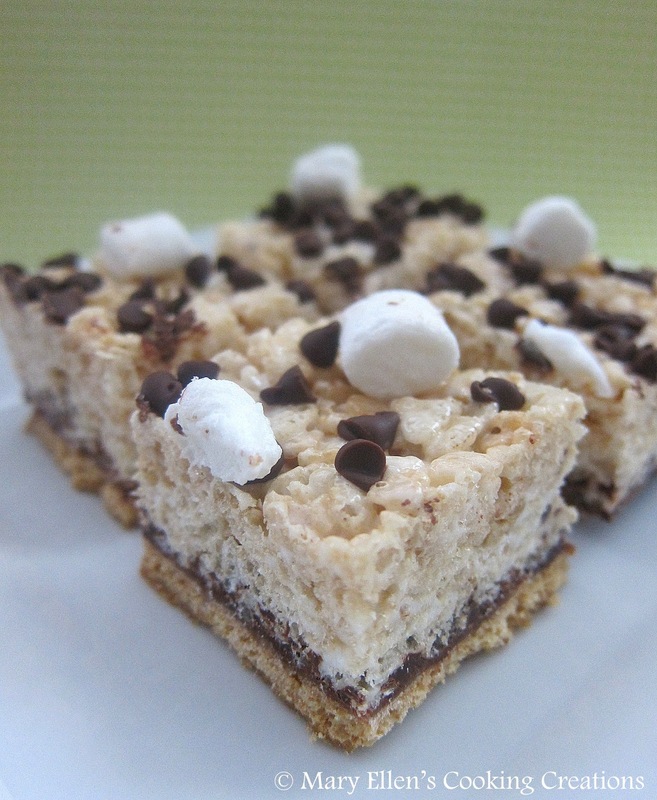 I used the entire 8 oz of chocolate in the treats, and then topped the treats with mini milk chocolate chips. Combine 6 tablespoons of butter and the sugar in a large saucepan set over medium heat. When the butter melts and begins to bubble, pour it over the graham crackers and spread evenly. Bake for 7-10 minutes, or until the sugar bubbles. Remove from oven and top with chocolate squares. Return to oven for 2 additional minutes to melt the chocolate. Remove from oven and spread chocolate evenly over graham crackers. Return saucepan to burner and melt remaining 2 tablespoons of butter over medium-high heat. Add the marshmallows and cook, stirring frequently, until the marshmallows are completely melted. Add the cereal and stir until incorporated. Scape the cereal over the chocolate covered grahams. Lightly grease your hands with cooking spray, then press the cereal mixture into the baking dish. Sprinkle remaining marshmallows and chocolate (or chocolate chips) over the top, gently pressing onto the warm cereal to adhere. Refrigerate to set. When ready to serve, use the foil overhang to lift the bars from the dish. Cut with a greased knife. Serve, storing any leftovers in an airtight container. I cut these treats into smaller squares since they would be served on a dessert buffet.